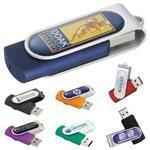 Hands down, these are our best selling USB Memory Sticks! 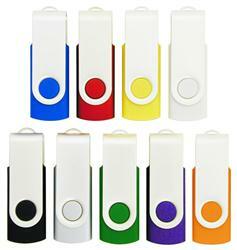 Available in an array of colors, these Custom Swivel USB Memory Sticks have a rotating cover - now more losing your cap! 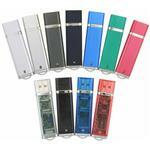 Flash drive folds into a protective aluminum cover. Available with an optional lanyard and gift box. Our flash drives are guaranteed, are printed here in the US, and sold by really fun, knowledgeable people who love to discuss memory size (from 512 MB all the way up to 32 GB and in between) Plug and play technology on Windows 98 or above and Mac OSX or higher. Need some data uploaded as well, no problem! **DUE TO THE RAPIDLY CHANGING MEMORY MARKET - PLEASE INQUIRE ON PRICE**. PLEASE SPECIFY MEMORY SIZE. FREE 1-DAY RUSH PRODUCTION AVAILABLE! Production Times Available: Standard 3-5 Day Production with Paper Proof. Dimensions: 2-1/8" x 3/4" x 3/8"